It's still really cold in Chicago. I know you people in LA are sad about your rain, and that DC is having another snow day, but it is March 3rd and I am still powerfully afraid that I'm going to get frostbite. The other problem is that this is the time of year when you've kind of run out of indoor activities and everything pretty much devolves into getting drunk in your house or getting drunk at a bar. Even this can lose its shine and fail to assuage the misery of an endless winter, so I brainstormed a bit, and I discovered a new indoor activity! Yes, still alcohol related, but also educational, and a little bit grown up. 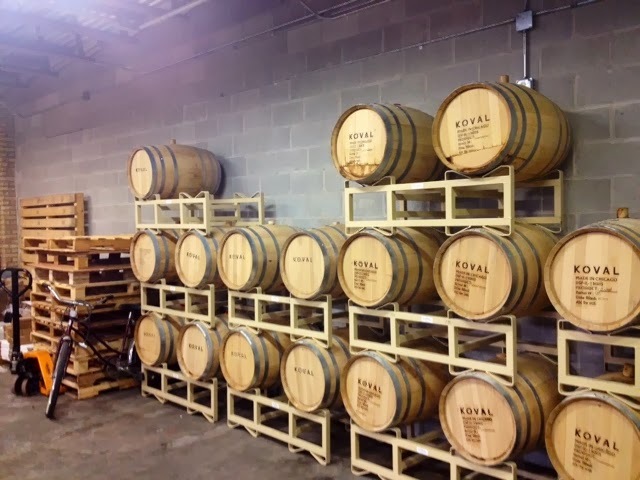 KOVAL Distillery is located on the North Side of Chicago and has the distinction of being the first legal distillery within Chicago city limits since the Prohibition era. It was started by a a couple who decided they were done with DC and ready to have a family, and what goes together better than alcohol and conception? Since I like learning, and I basically knew nothing about distilling, I was quite pleased at the detail our tour guide went into about the process, while still managing to avoid any potentially terrifying examination of chemistry. 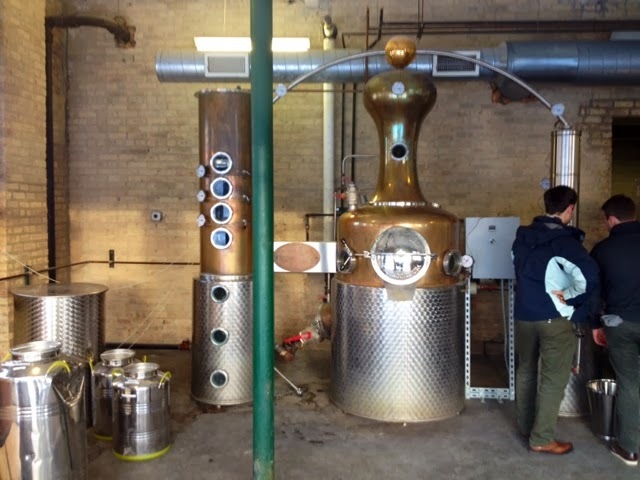 The facility we toured was the original space for the distillery, which was founded in 2008, though they have since moved their main production about a mile and a half down the road to a larger space with a much larger still. That there is a still, which I believe she (I can't remember our guide's name, but she was lovely) said was a 300 gallon still, but I have no confidence in my memory, since I was a little brunch drunk. The best part? Samples! 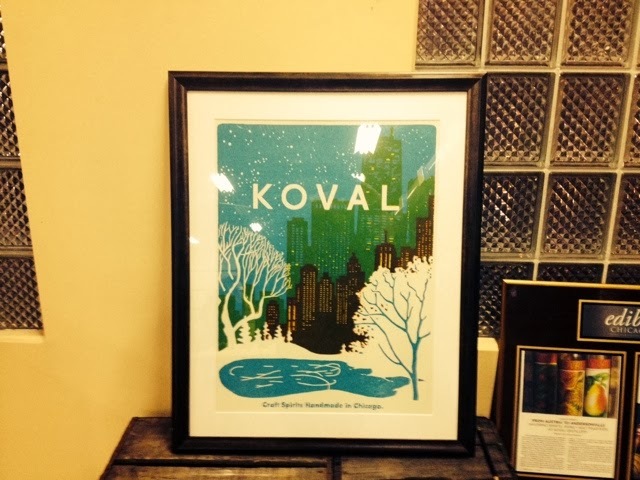 Of the overwhelming number of whiskeys KOVAL produces, we sampled their White Rye, Toasted Rye, Four Grain, and Millet. 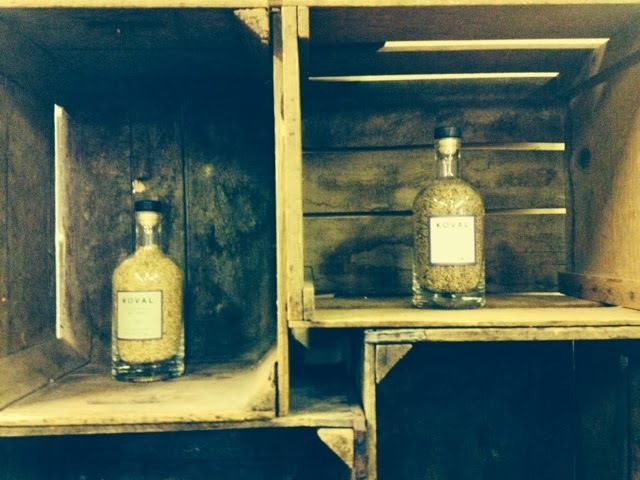 They also produce a selection of spirits and liqueurs, of which their Sunchoke Spirits, Rose Hip Liqueur, and Coffee Liqueur were provided for a taste. I'm already quite a fan of the Rose Hip Liqueur, but that Coffee one definitely knew what it was doing, and would be a great addition to any home bar or kitchen. I don't want to spoil the whole tour for you, so I'll leave it there. Although it's not free, I don't think $10 is too much to pay for something interesting to do, and you'd be supporting a local business. You can view the full tour schedule and reserve a spot online at their website, in addition to learning more about their full range.